VGC no longer conducts gliding operations from Bembridge, however there are a number of resident power aircraft operating throughout the week. Also model flying can be active at any time of the day to the North side of the airfield, up to 500 feet agl. 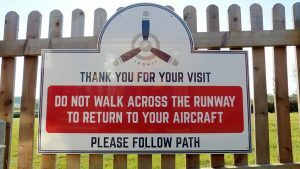 Visiting aircraft are very welcome however, prior permission is required (PPR) for any aircraft to land at Bembridge Monday to Friday, or at times outside the operating hours of Bembridge Radio. PPR may be obtained by email only. Landing & take off will be at the discretion and risk of the visiting pilot. An acknowledgement will not be made unless specifically asked for in the message. Vectis Gliding Club Ltd provides an Air/Ground radio service on 123.255 Mhz (call sign “Bembridge Radio”). The Designated Operational Coverage (DOC) of this service is 10 NM and 3000 feet. Radio Operating times are between the hours of 09:30 and 16:30 in Summer (BST) and 10:00 to 15:30 in Winter (GMT) on Saturdays, Sundays and Public Holidays. As a radio service will be provided during these times, PPR is not required. The radio service is not normally provided outside of these hours, or on weekdays, unless a special arrangement has been made when requesting PPR. Circuit height is 1000 feet AGL (for QNH Bembridge is 60 feet ASL). The circuits at Bembridge are always to be conducted on the north side of the airfield and will therefore be 30 right or 12 left. Standard overhead joins may be undertaken at the discretion of the pilot, with the descent being on the south (dead) side over the sea. Blind calls on the airfield frequency 123.255 should be made outside the published operating hours. 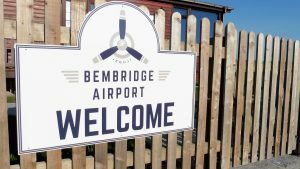 Departing aircraft are requested to avoid over flying Bembridge village at all times, particularly when climbing out on RW 12. We have a good relationship with our neighbours and we want to keep it that way. Parking Visiting aircraft should park on the North side of the runway, and walk cross to the south side to exit the airfield. Care should be taken when walking from the aircraft parking area; please stick to the marked pathway next to the hedge and keep a lookout for other aircraft. Please do not walk across the runway! Do not park on the south side of the runway as this this would obstruct the active 30/12 grass strip. If you want to use the grass strip to land, please ask for a call back when leaving your message for a briefing concerning it’s condition and serviceability. After landing, please taxi to the North side and park with the other aircraft. 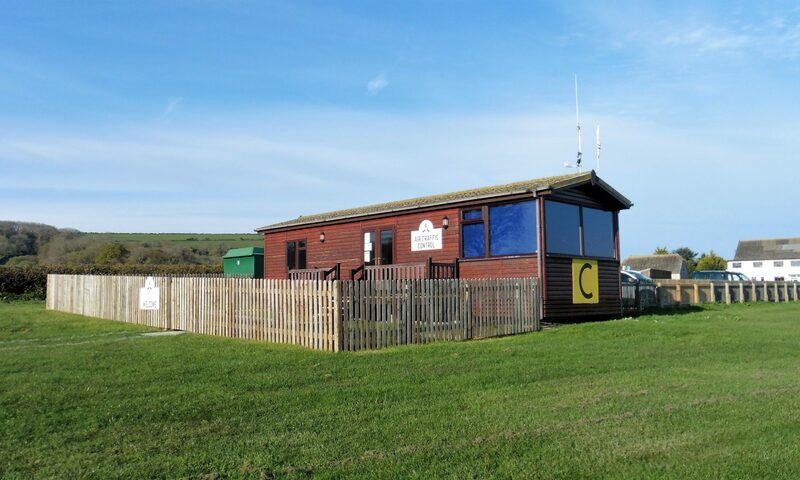 Visiting pilots should make their way to the Bembridge Radio Control Point (“C”) on the south side of the main runway for payment of landing fees. Please do not walk across the runway! If outside the published operating hours or if the Control Point is closed, please fill in the pre-printed envelope and post in the VGC letter box located in the passageway to the right hand side of the 4 bladed prop on the wall of the Propeller Inn. During opening hours the pub will also accept the landing fee. Sandown Airport EGHN (freq 119.280MHz). Sandown Airport is an active airfield situated 3 miles to the south west of Bembridge and visiting pilots should be aware that traffic departing Sandown RW 05, and traffic departing RW 30 at Bembridge are on a converging course. All pilots are therefore strongly advised to execute a turn to the north when departing Bembridge to minimise any potential risk. Weekends and Bank Holidays – radio service provided. Weekends and Bank Holidays – no PPR required. 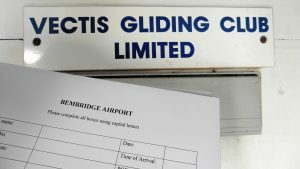 Unlicensed, managed by Vectis Gliding Club Ltd (VGC). Main RWY 300/120 – 827 x 12 m concrete. Grass RWY 300/120 Call to obtain condition and serviceability. Prior permission essential. Grass RWY 23/05 not currently available. Circuit height 1000 agl North side 30 RH or 12 LH as appropriate. Overhead joins OK at discretion of pilot, descend on South (dead side) over sea. Call Bembridge Radio on freq 123.255 up to 10 nm inbound. Blind calls to Bembridge Traffic if no response form tower. Do not park on south side of runways. Visitors park North side. Take care when walking to/from the aircraft parking area; please stick to the hedge and keep a good lookout. Please do not walk across the runway! Pay landing fees at Bembridge Radio Control Point (C) on south side of main runway or in Pub or in VGC honesty box.